Top row (left to right): 1. Christine Thomsen, 2. Marc Conover, 3. Christina Griffitts, 4. Eric Edmundson, 5. Thomas Orlando, 6. Richard Gandolfo, 7. Christie Campos. Second row: 1. Norman Klino, 2. Laurie McVay, 3. Rodney Alemania, 4. Diane Ratto, 5. Brian Anklam, 6. Sheila Street, 7. Glen Pettibone. Third row: 1. Julie Wyld, 2. Brian Bast, 3. Bernice Pontrelli, 4. Steven Gerigk, 5. Diane Barnhouse, 6. Jeffrey Nellis, 7. Heather Williamson. Fourth row: 1. Dirk Chonzena, 2. Maria Mirci, 3. Andrew Conover, 4. Teresa Henry, 5. Marc Rodriguez, 6. Danielle Deglman, 7. Christopher Dolan. Fifth row: 1. Claudia Mirci, 2. Gene McKamey, 3. Jacqueline Guillory, 4. Paul Concannon, 5. Andree Enos, 6. Jimmy Cooper, 7. Lina Tortolero. Sixth row: 1. Tony Montez, 2. Traci Laufenberg, 3. Chris Carrano, 4. Lisa Walser. Seventh row: 1. Monsignor R.G Adams, 2. Sister M. Emmanuel, O.P., 3. Miss Egan, 4. Nadine Valero. 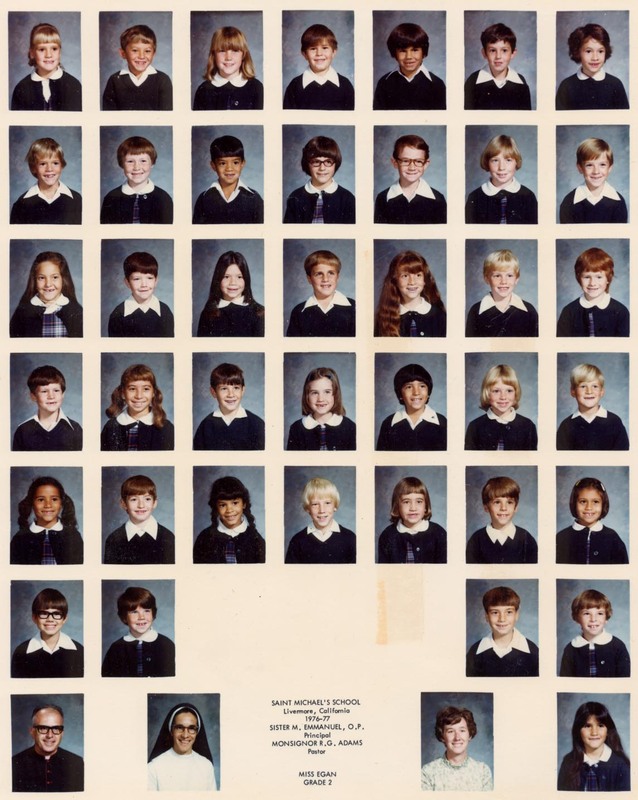 The kids in the picture are members of the high school graduation class of 1987. To find other pictures of the class of 1987 in the archive, see Livermore class pictures listed by year of high school graduation: 1987. And if you have any pictures of the class of 1987 that you would like to share, please submit them to the Archive.